The National Disaster Risk Reduction Management Council (NDRRMC) urged Filipinos to remain alert and updated despite the confirmed postponement of the South Korea satellite launch supposedly set today. NDRRMC chairman Undersecretary Benito Ramos said earlier that he got a message from Col. Ireneo Maningding, military attaché of the Philippines in Korea, that the launch schedule is postponed due to technical glitch. 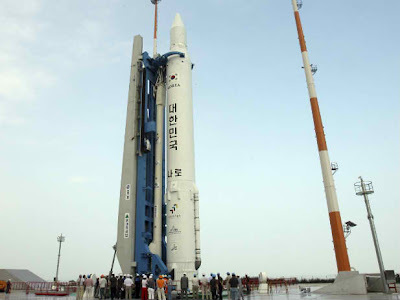 However, Benito stressed the need of everyone to remain alert because the South Korean space agency may lift the suspension any day until October 31. He added that the NDRRMC will make sure that daily updates will be sent out for the public to know the status of the said satellite launch. A month earlier, the NDRRMC has put in place a contingency plan as South Korea announced that it will launch its third Science and Technology Satellite-2 (STSAT-2) aboard Korea Space Launch Vehicle-1 (KSLV-1) at the Naro Space Center in Goheung, Jeollanam-do. Concerned government agencies like the Civil Aviation Authority of the Philippine (CAAP), the Philippine Air Force (PAF), Department of Interior and Local Government, the Philippine Navy, the Philippine Information Agency, and others were all set with their plans to make sure that no one gets affected by the launch.